Yes… my griller works the best for me to smoke pretty much everything I want! 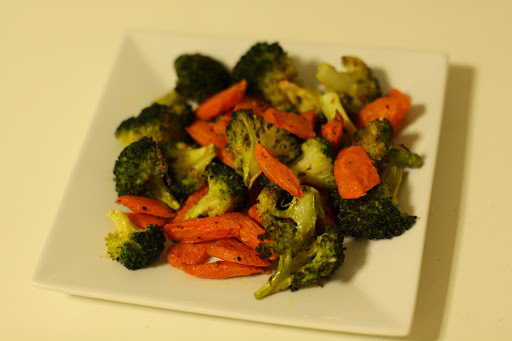 :) And this time… I grabbed a bunch of broccoli and a pack of baby carrots from super-specials rack! I thought of making it while having weekend breakfast, but had to wait for 3 long days if I stick to it… So roasted n grilled them when I planned pasta in dinner!!! If you’re planning to have a healthy plate as a side or a part of your breakfast, this will work great for you! – Boil water on high heat and add broccoli florets and carrots in it. Parboil it for 5 mins (or microwave). – Drain and rinse with tap water. Pat them dry with a kitchen towel. – Transfer it to a big bowl and mix well after adding salt, olive oil, oregano and chilly flakes. – Put veggies on baking tray. – Oven-roast it for around 15-20 mins on 200 degrees. – Transfer the tray to griller and grill it for around 2-3 mins. It will start smoking and golden brown on surface. – Drizzle a few drops of lemon juice and it’s ready to serve!!! – Potato, cauliflower florets, capsicum, purple yam can be used the same way!!! – Oven-roasting veggies by packing them in aluminium foil will keep them juicy. I do it only when it’s to be served with steamed rice!